Today, we’re beginning a new series of posts on our blog. Fuqua Faculty Scholarship will briefly highlight currently published research by members of the faculty here at the Fuqua School of Business. In addition to a citation and an adapted abstract, we’ll provide a link to the featured article’s full text online within one of the e-journal platforms provided to Duke users by Ford Library or Duke Libraries. If you’re reading these posts from off-campus, you’ll need to enter your Duke Net ID and password in order to view the article full text. Ben-David, Itzhak; Graham, John R.; Harvey, Campbell R. (2013) “Managerial Miscalibration“, Quarterly Journal of Economics, Volume 128, Issue 4, November 2013, Pp. 1547-1584. A person is said to be “miscalibrated” when they overestimate their ability to predict the future, or because they underestimate the volatility of random events. Miscalibration is the systematic underestimation of the range of potential outcomes by individuals, or in the language of psychology, excessive confidence about having accurate information. Ben-David, Graham, and Harvey ask, does miscalibration apply to senior financial executives and managers, who when designing corporate policies, must routinely estimate future unknowns (e.g., demand, cash flows, and competition)? 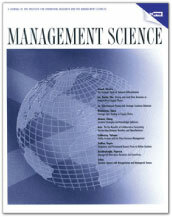 Using a unique 10-year panel that includes more than 13,300 expected stock market return probability distributions, the authors find that executives are severely miscalibrated with regard to estimating future unknowns — to the extent that realized market returns are within the executives’ 80% confidence intervals only 36% of the time. Post content only © Carlton Brown & Ford Library – Fuqua School of Business.